Overview: "Tadadada" and the wedding band continue playing throughout the night. In between mad violin and percussion solos you sneak out and enter the Gypsy Queens' caravan. You hear a cat screech. The atmosphere is inherent: candles, Tarot cards and a Crystal ball await you; perhaps your luck is around the corner? Gypsy Queen tells you that her name is Rose and that she can make all your wishes come true with this new 5-reel, 20-payline Video Slot game. You wait in exhilaration. 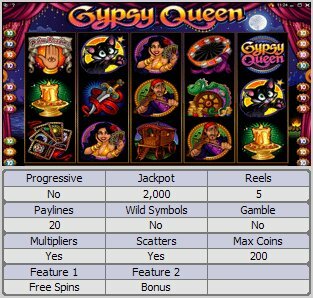 Bonuses and free spins are all over the show while the graphics and sound bytes are immaculate bringing authenticity to this Gypsy outpost. The Gypsy Queen reads your palm and gives you a wink, a better sign than giving you her tears. Similar Slots: If you like Gypsy Queen, you might like these other 5-reel slot machines: Boogie Monsters, Bush Telegraph, Crazy Chameleons, K9 Capers, Lucky Stars.